Ireland is a small country. Driving from tip to tip, Creeslough, Co. Donegal to Bantry, Co. Cork, will take six hours and 52 minutes (Google Maps). To put this in perspective, it took me longer to drive from my hometown Kinburn, ON to my university in London, ON, and that isn’t even the full length of the province of Ontario. Although Ireland is small, each county is known for something different. People who live two hours apart will support different sports teams, embody different cliches, and have completely different accents. In Canada, those who live two hours apart are practically neighbours. People here don’t even need to be from different counties in Ireland to sound different — two people from different parts of Dublin have stronger accent variations than people who live at opposite ends of Canada. For example, there is a stark contrast between the “posh” D4 accent and a classic North side accent. A good way to imagine a D4 accent is to picture someone elongating each syllable while speaking with marbles in their mouth, whereas a typical North Dub speaks so quickly they’ll leave you with verbal whiplash. Although these areas all fall under the Dublin umbrella, the culture is different, and I find these differences fascinating. Because the island is so small, there is no excuse for me to not experience every county. Last year I went to Galway, Tipperary, Tullamore, Wicklow, Kerry, and Belfast. This year I kicked off the counties with the exciting Roscommon. The population of the entire county is 64,065, and the county town population is 5,017. 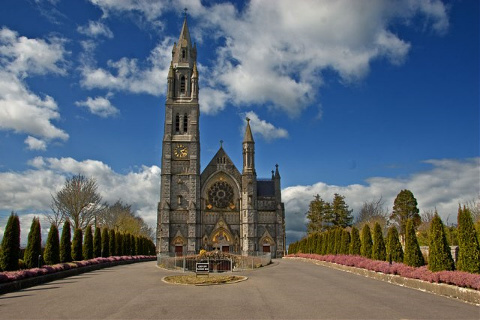 Roscommon has an area of 984 square miles and is the fifth least-populous county in Ireland. Needless to say, what was I thinking picking Roscommon? I got a Groupon voucher for a nice hotel, I thought Roscommon rolled off the tongue nicely, the town website said it was scenic, and I want to see all of the counties. I saw this town in its entirety, and I saw it quickly. It took about half an hour to do a full lap of the town. In terms of food, there was one cafe that was bustling during the lunch hour. It had very kind staff and offered soup, sandwiches, cakes, and even gluten free options. There was also three or four fast food places open in the evening, and one amazing Indian restaurant where we had the best naan bread I have ever tasted. Although there were few options for food, the sleepy town of Roscommon won’t leave you thirsty. In true Irish form, we saw about seven or eight pubs. For landmarks Sacred Heart is a beautiful church with stunning glass windows and there was an intriguing Abbey ruin behind our hotel. One highlight was a perk included in the Groupon voucher — we had “sparkling wine” on arrival, which turned out to be a fancy bottle of cider and two champagne glasses. Once I finished giggling over the fact that there was a cork in a bottle of cider, we realized it was the perfect refreshing beverage after spending the day in the leisure center. Ultimately, when visiting Roscommon the key is to bring good company. Wandering through a quiet town in drizzling rain and January wind is nice when you have a good travel partner. It’s a pleasant family friendly town, and visiting made me appreciate living in Dublin that much more.